In case of First level and second level cache in Hibernate, how do users fetch the updated data despite having cache? Does modification on data reflect in cache everytime? does a ConcurrentHashMap object contain 256 buckets by default? true, the "segments" are eliminated in Java 8. We know that HashMap object has 16 buckets initially. but ConcurrentHashMap has "segment" concept and a newly created object has 16 segments and each segment has a complete hashmap object. does it mean a ConcurrentHashMap object has total of 16x16=256 buckets? omg, such a simple question you made it so ugly. I was hoping answer regarding separate copies of final variables. What is a “non-initialized final variable”? Isn't that a contradiction in terms? Yes and no. Only local variables are created on the thread's stack, so there is no such thing as separate copies of fields. If multiple users means multiple threads are accessing this variable concurrently and don't have separate copies of this variable then how would they assign their own values to this variable? Is final variable thread safe? Do different threads have separate copy of final variable? Does only HashMap work on hashing technique? How do TreeMap and LinkedHashmap work internally? If HashMap work on hashing technique then how do other maps work internally? real time example for inner class and static inner classes. "real-time" word is probably given by indian tutors, it refers the real-project(application), so he expects you to answer in context of a real-project unlike you provide examples of 'Animal-dog' classes. Like if questioner is asking about real-time usage of inner class, he means to ask what scenario of a real project would you decide to use inner classes in. Who decides what data can and cannot be stored in Cookies? Bear Bibeault wrote: Don't store passwords in cookies. While developing an application, if I don't write any code of Cookies, will browser never save any data of my web app in Cookies? Once I develop a web app, who decides what data can and cannot be stored in cookies? How can one make sure that passwords will not be stored in cookies? 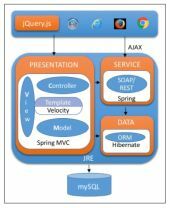 What is the equivalent of precompiled queries or PreparedStatement in Hibernate and Spring-Data? Do you use WebServices on Service Layer as well? I mean usually what I've seen so far that all the requests come to the Controller and controller passes them to the Service layer. I was reading something else but came across this picture, it is an architecture of Java based web application. According to this picture and explanation, Ajax call does talk to the Service Layer directly, not Controller. I have been confused about it. Do developers design their applications this way? When you need to send SMS to the client, how would you add them to the queue?